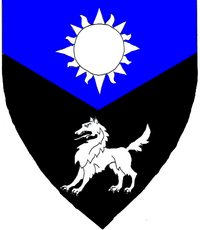 Per chevron inverted azure and sable, in pale a sun and a wolf statant argent. 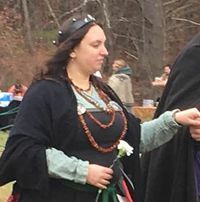 Æsa feilinn Jossursdottir (called Feilinn by her friends) started attending events in 2003 with the Market Day at Birka. A lifelong resident of Quintavia, she became more involved in the Society after joining House Darostur in 2011. In 2012, she began exploring scribal arts and worked with a variety of other scribes. Feilinn was Award Arms by Their Majesties Edward II and Thyra. She became part of the retaining staff for their reign and enjoyed many adventures across the East Kingdom. In 2014, Feilinn became part of the Head Retaining staff for Their Majesties Edward III and Thyra II. She was made a companion of the Pennon of the East during Gulf Wars (March 2015). Later she was humbled to receive a court barony from Their Majesties and a coronet made by her household. In May 2015, she became an apprentice to Mistress Eva Woderose. She enjoys scribal arts, archery, cooking, and dancing in her free time. She occasionally works with The Worshipful Company of Their Majesties’ Underwear on mischievous undertakings and various projects. Æsa feilinn is an Icelandic viking lady (9th/10th-ish century) and is married to a Kievan Rus trader. Though most often found in viking garb, she tends to wear some Persian garb in the summer and occasionally has been seen masquerading in late period Italian dresses. In case of Court, please contact Eva Woderose and Sergei Rozvad syn. Feilinn enjoys all types of scribal works! Persona appropriate scrolls or scrolls that catch the artist's eye/fit their favorite style are equally loved. Follow your heart!